Super Thick Ice Cream Shake. | Eat More Plants. 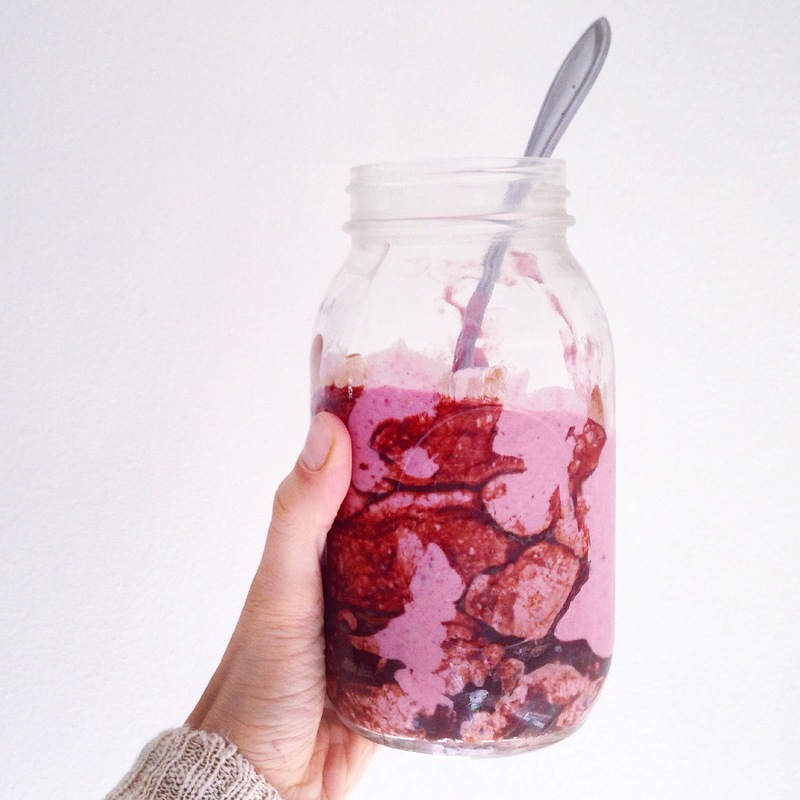 It’s amazing how a few little tweaks can turn an every day smoothie into a decadent treat. 1 c of frozen raspberries and a handful of very soft, gooey medjool dates (about 6 or 7). Add a little water if necessary to get the mixture blending but you shouldn’t need much, if any. When you get that blended almost completely smooth, add in 3 frozen bananas. Break them into chunks before freezing to make the blending easier. Big chunks of frozen bananas do not make a blender happy, even the almighty vitamix. Whisk a little extra virgin coconut oil with some raw cacao powder to add some crunch to this. As you drizzle it over your cold ice cream, it will harden up. Without the cashews and coconut oil drizzle, this is my normal, go-to morning smoothie. The little extras make for a nice treat. Healthy, plant based fats need to be included in your diet! Having a moderate amount of unrefined fats in your balanced diet helps your body regulate hormones, improve metabolism and keep you satiated. You don’t need to eat nuts and oils every day/every meal but including them like this, 4 or 5 times each week, is absolutely beneficial. Vitamins A, D, E and K are fat-soluble vitamins, which means that they rely on fat for absorption and transportation throughout the body. Vitamin A supports vision, vitamin D helps with bone strength, vitamin E boosts the immune system and vitamin K promotes blood clotting. I always love the way cashews blend into such a creamy texture, especially when you soak them. Soaking your cashews also make the nutrients easier for your body to absorb, as I’ve talked about in previous posts.